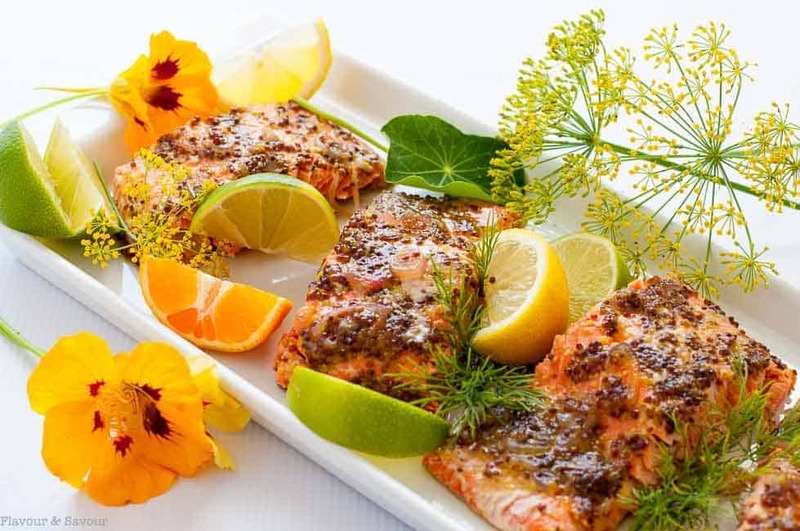 This Honey Dijon Glazed Salmon recipe is quick and easy to make. Cooked in foil, you can grill it or bake it. Paleo and gluten-free. This Honey Dijon Glazed Salmon has been my family’s favourite way to cook salmon for more years than I can remember. While most wild salmon has enough flavour to stand on its own, this glaze enhances that natural goodness and puts it over the top. Fresh wild-caught salmon is a treat at any time of year, but I love to grill it in the summer. This simple glaze of grainy Dijon mustard, honey, red wine vinegar and shallots makes an appetizing presentation for a dinner party or, in my case today, just for the two of us! 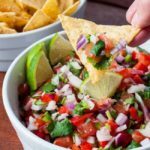 Who doesn’t love meals that are ready in less than 30 minutes? This Honey Dijon Glazed Salmon is quick to prepare. 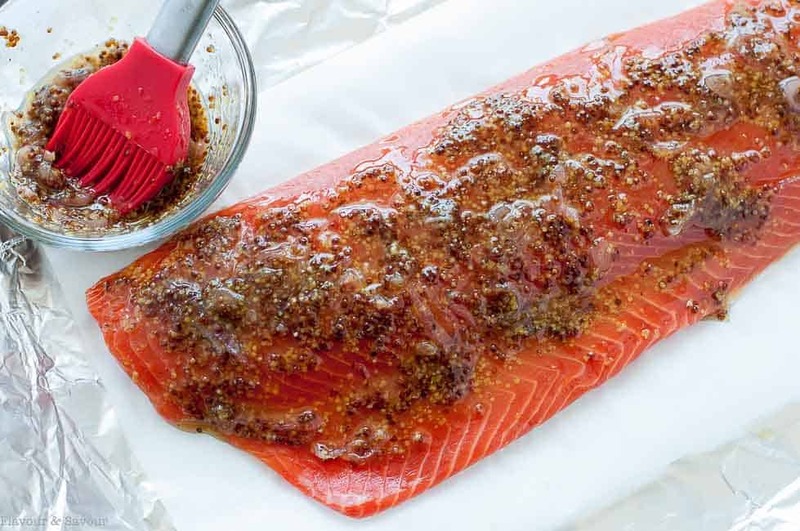 Lay a salmon fillet on a sheet of heavy-duty foil (and if you don’t like your food cooked on aluminum foil, line it with a sheet of parchment paper.) Brush with the glaze, fold the foil to seal and grill or bake! That’s it. Cook until the fish begins to flake easily with a fork, then remove from the grill. If you like the glaze to be slightly crispy, open the foil once the salmon is cooked and pop it under the broiler for a few minutes before serving. Garnish with dill or parsley and some citrus slices, serve with fresh garden vegetables or a salad and dinner is done! 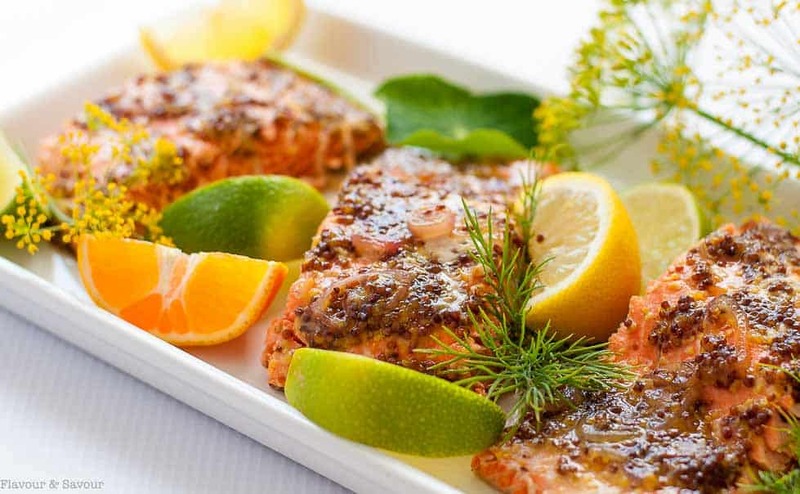 A crisp, fruity Riesling or Gewurtztraminer pairs well with this salmon. Enjoy! Love salmon as much as I do? You might like these, too. 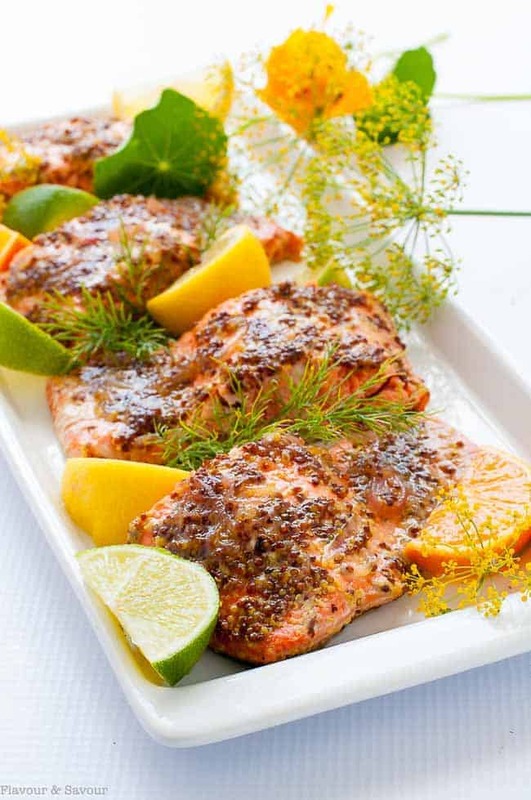 This Honey Dijon Glazed Salmon recipe has been a family favourite for years. It's quick and easy to make. Cooked in foil, you can grill it or bake it. 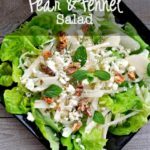 Paleo and gluten-free. Heat oil in a small skillet or saucepan. Add shallots and cook until tender, about 2 minutes. Add red wine vinegar, then mustard and honey. Stir until combined and remove from heat. Spread a large sheet of heavy-duty aluminum foil on counter. If your salmon fillet is large, you may need to overlap two sheets. Line with a smaller sheet of parchment paper. 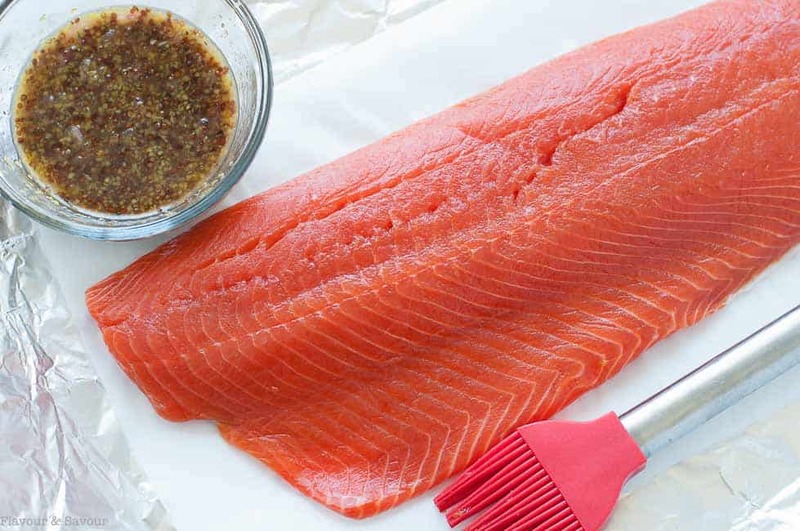 Lay salmon fillet on top and brush with glaze, reserving 1/3 of the glaze to use after baking or grilling. Fold foil over and secure the ends to enclose the salmon completely. Place on pre-heated grill and cook for 10 - 15 minutes (or bake in a pre-heated 400°F. oven) until fish flakes easily with a fork. Open foil package, brush with remaining glaze and place under the broiler for no more than 2 minutes to make the glaze a little crispy. Transfer to a serving platter and serve. Thank you for this recipe!! 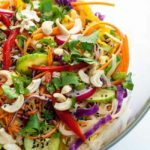 I love the simplicity of ingredients and can’t wait to try this for dinner! Grilled salmon is one of the top summer go to meals at my house. 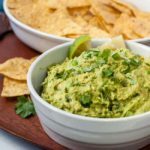 So easy and quick to make. Love your pictures! The colours are amazing. So fresh and appetizing. I have this recipe earmarked to try next week. I love fast and tasty meals, and salmon is always so quick and easy! 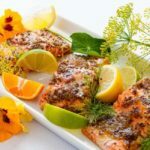 This wild salmon recipe looks delicious and reminds me a bit of potlatch salmon. I can’t wait to try it. Thank you for the recipe. Thanks Denise! Hope you like it as much as we do. It’s an easy one! Wow Elaine. 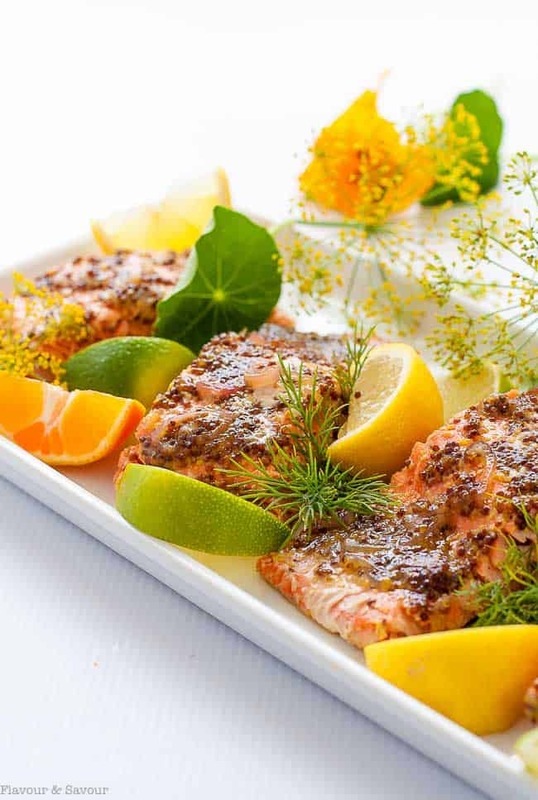 This salmon looks incredible and your photos are drool worthy!! There is no place like BC for salmon. The worlds best, in my opinion. 🙂 Thanks for sharing. Thanks so much Sharon! Gotta love wild salmon! Oh my, this salmon looks gorgeous and absolutely mouth-watering! What a gorgeous looking plate. I can clean it off. That is a healthy and delicious dish. Thanks! We never get tired of it. Thanks! Salmon is such a healthy choice. Hope you get a chance to try it soon. WOW! Such a beautiful dish, and the flavors sound amazing! Thanks Jillian! It”s a favourite with my family. Do you know I LOVE honey mustard (any mustard) on salmon! SOOO good!